Welcome to my website. It is designed to provide information and advice about health, physical fitness, sports, sports injuries, pain from accidents and diseases, painful conditions and problem prevention. All age groups are included, from children to veterans. The aim is to help you to help yourself to cope with and, if possible, recover from problems affecting your physical health. Qualified as a physiotherapist, I have been in practice since 1976, helping people through pain, injuries, trauma and loss. Every patient teaches me something, and I love the process of constant learning which clinical practice entails. My guiding principle is: “The power of the human body to heal itself is awesome”. Without self-help and self-motivation, healing cannot happen. With the right kind of determination, anything is possible. The website contains articles on health topics, including coping with injuries, overcoming illness, and constructing a healthy lifestyle through diet, exercise and sport. There is a section of notices including items of interest, individual correspondence and subjects publicized in the media. There is also a contact address where you can send any questions you may have about the material you have read or problems you would like advice on. Questions are answered individually in confidence. Questions and answers which might be of interest and help to other readers are also published on the website, without identifying the writer. There is a section about life in Dalmatia, for anyone who is interested in what happens in a holiday resort away from the beach, and after the tourists go home for the winter. Also a section about members of my family: the Grisogono family is the oldest surviving noble family in Dalmatia! Access to the website is free, there is no part of the website for which a fee is charged, nor is there any part which is commercially sponsored. The material is copyright, and may not be published or distributed in any way except with the author's written permission, but you are welcome to print off the articles for your own personal use. The anatomical diagrams by Peter Gardiner are reproduced on this site with the artist's kind permission. They are strictly copyright, and must not be re-used in any form except with written permission from the artist himself. You can find Peter's contact details here. To see Peter's professional customer website, click here. I am also extremely grateful to professional photographer Richard Gardner (London) who has kindly given permission to reproduce some of his pictures on the site. 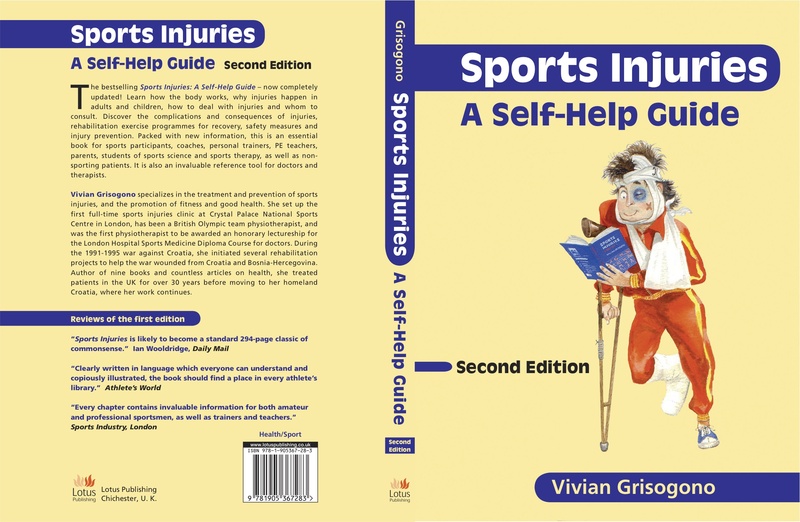 Sports Injuries, a Self-Help Guide, 3rd edition (revised in a new format) Published by Lotus Publishing UK, (30th January 2019). Available on Amazon UK, Amazon USA, Amazon Canada, Amazon Australia, Amazon India, among other outlets.